Buoyancy Formula: Why does an Iron Piece Sink in Water but a Ship Float? I will explain the theory later but first a small and simple experiment would be useful to help learn the logic behind this phenomenon of floating. The materials required are as follows. Make sure that the metal rod is small enough to physically go inside the jug without touching any of its sides, otherwise take a smaller rod or a bigger tub. Hang the rod in air using the thread/spring scale, measure its weight and note it down. Carry over the rod while tied to the scale and immerse it fully in water. Note that the reading on the scale will change. Note this reading. Subtract the two readings to get the change in weight. So how do you explain this? Does the rod get lighter in water? Buoyancy is the force where a liquid or a gas exerts on an object which is partially or fully immersed. The direction of this force is upwards. We also know that weight is due to the pull of gravity and acts downwards. Hence these two forces are in opposite directions and tend to cancel each other out. A measure scale such as the spring balance, measures weight which is the force by which gravity pulls the object down. Since after immersing in water some of the gravity force is cancelled by buoyancy, the remaining downward pull is registered as weight of the object. Another interesting observation is to measure the volume of the metal rod by using the mathematical formula for finding volume of a cylinder. 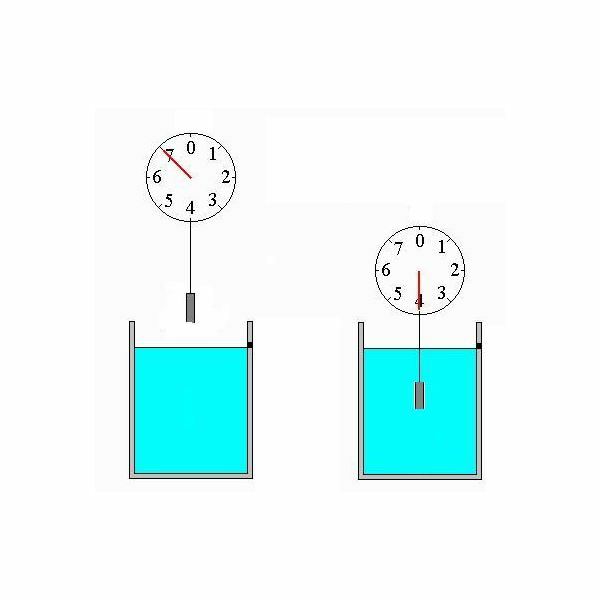 Multiply it by the density of water (value is 1 at normal temperature) to get the weight of water which is equal in volume to the rod. You will be surprised to see that the weight of the volume of water is equal to the weight loss of the object. Hence there is a subtle relation between this, known as Archimedes Principle which we shall study in a separate article. We see that a ship floats on water because the force of buoyancy acting on it from below keeps it lighter than it actually is, but a small iron piece may not displace much water due to its shape, hence it sinks. So even for a given weight, whether an object floats or sinks also depends on shape.